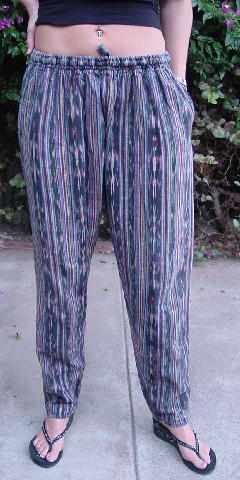 These 100% handwoven cotton pants were made in Guatemala. They have a 1" wide elastic waistband with fabric matching interior drawstrings. 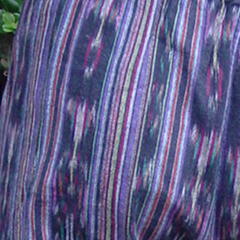 There is an open pocket on the right back side. 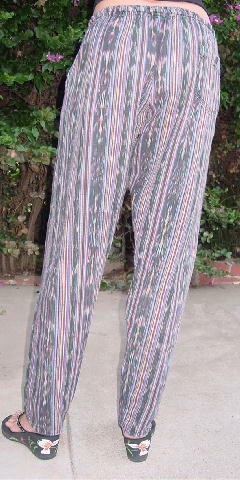 They have a freeform line and a vertical stripe pattern in yellow, black, orange, purple, red, teal, pumpkin, and pink. The tag says XL, but they fit like a Small/Medium. They look best worn baggy.